After sweeping some 30 countries outside the US market off their feet and earning the title of the world's fastest-growing international salty snack brand, the successful, favorite American snack makes "aliya" and lands in Israel's stores! The first flavors to arrive are Nacho Mix and Ranch Grill. One year later we decided to enlarge the family and added a new flavor, American Barbecue. 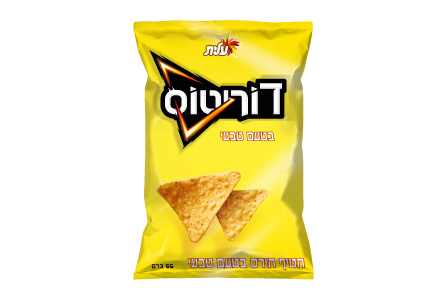 And that isn't all – we quickly discovered that Israelis are crazy for Doritos, which took the local corn snack market by storm and gained a market share of around 65%! 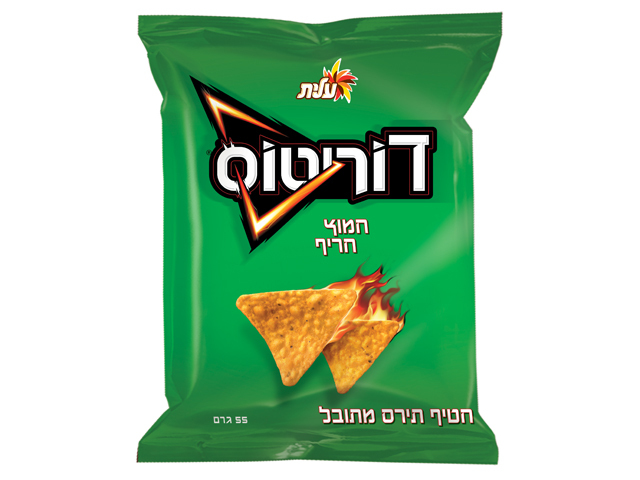 For Passover, we launched a special edition of Natural Flavor Doritos. Due to consumer demand the product stayed on the shelf after the holiday, and you can find it in stores to this very day. In 2001 we also changed the product packaging and replaced the logo in English with a Hebrew one. In 2003 we announced the launch of Doritos Dip – salsa in two flavors, mild and hot, that was developed together with a new snack especially made for dipping. The new Doritos product was designed for entertaining, snacking in front of the TV, or for anyone looking for a quick snacking solution. 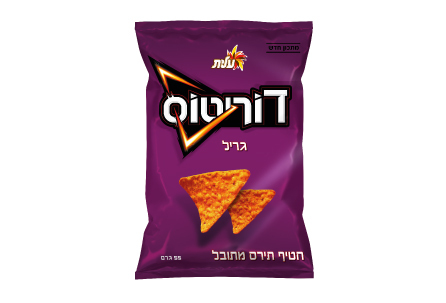 In April 2005 we launched Doritos in new flavors, kosher for Passover: Grill and Sweet 'N Sour. In the first half of 2005 Doritos was the Company's fastest-growing salty snack brand, accomplishing 50% growth in value terms. Flaming Hot Doritos landed on the shelves as a limited edition. About one year later, following the product's amazing success, Flaming Hot Doritos was re-launched and is still on the shelf. For the first time in Israel, the consumers were the ones who made and selected a new commercial for the brand. The competition sponsored by Doritos and the successful reality TV show, "A Star Is Born 5", invited consumers to propose their own commercial for Doritos, which was broadcast just before the winners were announced in the finals of the show. Following the campaign's success, Doritos launched the "An Ad Exec Is Born 2" in 2008 as well. Consumer involvement continued, and in 2009 we invited surfers to design the Doritos pack including a road safety slogan as part of the "Drive Differently" campaign. The pack chosen by surfers was distributed in a limited edition and helped raise road safety awareness. In 2010 Doritos and Tapuchips ran a crazy campaign – whoever texted the code on the pack won NIS 500 or another bag of snack food. Every day consumers won tens of thousands of shekels in the cellular game, with one surfer winning NIS 1,000 in the daily draw on Facebook. In 2012 we enlarged the Doritos family again, adding new snacks. In June, Puffed Doritos were launched for the first time – little triangular 3-dimensional snacks with a light, airy and crunchy texture, in two devastating flavors – Barbecue and Sour Cream & Onion. A few months later we launched the perfect combination – two new Doritos flavors in one bag – American Cheese and Spicy Grill! Doritos begin life as a huge sack full of corn kernels. First we cook them, soak them and rinse them really well. Then we grind the kernels and make a delicate corn dough, which is flattened and cut into cool triangles. And then we work hard to create the perfect bite that crunches and crackles in your mouth! How? First we bake the triangles and then fry them. Last but not least is the flavor. Here each triangle gets a dash of salt or special spice and officially becomes a Dorito! Why is the bag full of air? Truth is, we wanted to put you all in a party mood, even if you forgot the balloons. Just kidding… Actually, there's a really good reason. First of all, each bag of Doritos weighs the same (the weight is also noted on the bag). Second, the bag is filled with air to protect the product from being damaged during handling (trucks, price stickers, stacking on the shelf, etc. ), so that you don't end up with a bag full of crumbs. But never fear, if we find out that you really miss a certain flavor, you can be sure we'll bring it back. Is there anywhere I can buy a Doritos flavored spice? Marco Polo asked us the same question. We told him he'd have to look everywhere in the world for it. Is there a boat ready? Do you have any recipes with Doritos as an ingredient? 1. Beat the eggs with a tablespoon of water. 2. Dip the chicken slices in the egg mixture and then roll in flour. 3. Return the chicken slices to the egg mixture, and then roll them in the crushed Doritos. 4. Fry in hot oil for 5 minutes or until the chicken bites rise to the top. 1. Cut the avocados in half and remove the pit. Remove the flesh with a spoon and place in a bowl. 2. Mash the avocado with a fork to the consistency of medium-sized lumps. Add the remaining ingredients and mix gently. 3. Cover with cling film to prevent the mixture from turning brown. Refrigerate for 1 hour (best prepared shortly before serving). 4. Serve with Doritos Dip. 1. Spray a frying pan with nonstick cooking spray, brown the ground turkey with one onion until the meat is no longer pink. 2. In a bowl, mix the remaining onion, tomatoes, coriander, hot peppers and salt. Mix well and correct seasoning. 3. Combine the turkey mixture with the tomato mixture, add the chili sauce and Tabasco and set aside. 4. Heat a skillet with a tablespoon of olive oil and fry the red peppers, add the wine and continue to fry for several minutes. Set aside. 5. Place a layer of the turkey mixture, about 1/2 cm (1/4 inch) thick, in a baking tray, followed by a layer of Doritos and then a layer of peppers. Repeat in sequence, ending with a layer of Doritos. 6. Bake in a 180C oven (350F) for 30-40 minutes.